10, 20, 50 and 100 ml polymeric bottles. Innovative drug with antioxidant, antihypoxic and membrane protective properties. Absolutely safe, so it can be used for premedical care or to treat agnogenic pathologic conditions. 1 ml of Emidonol 10% solution for injections contains emidonol® substance - 100 mg (as an active ingredient). Emidonol 10% is antioxidant drug (free radical inhibitor). The drug has frank antioxidant, antihypoxic and membrane-protective properties providing therapeutic and preventive effect in various hypoxias. 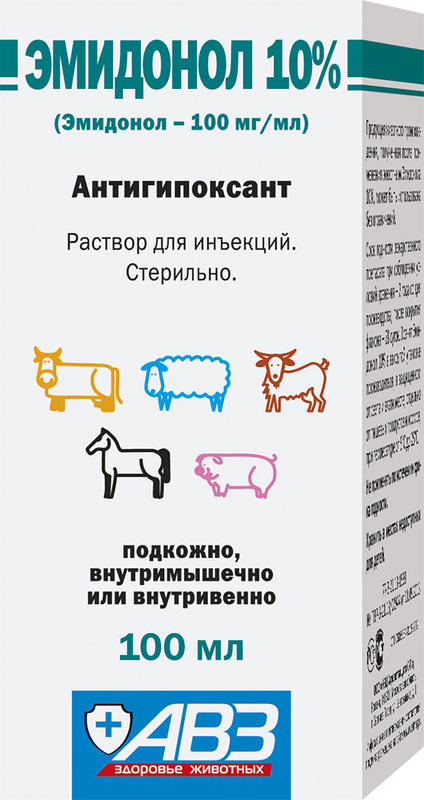 Use Emidonol 10% solution for injections in cattle, small ruminants, horses and pigs with acute and chronic cardiovascular and cardiopulmonary impairments, diseases associated with inflammatory processes, wound pathology (wounds, dermatitis, eczemas, trophic ulcers, ambustions, freezing injuries); intoxications (including food poisonings and cases after general anesthesia); during recovery period after previous diseases and surgeries. The drug is used in animal, pig and fur production to increase productivity and breeding efficiency, to treat breast dysfunction, to prevent and treat stresses caused by transportation or animal overcrowding, as well as to increase viability of growers. Use the drug for treatment and prevention of internal ishemic affections associated with hypoxia in sport animals. Treatment and prevention: subcutaneous, intramuscular and intravenous administration. Administration frequency is 1-2 times a day within 5-15 days. Animal production received during the drug administration can be used without restriction. Store in closed original package. Protect from light and moisture. Keep out of the reach of children and animals. Store separately from food and animal feeding at 5-25°С.